You’re ready for your holidays in Cancun and among other activities that you’ve been thinking of doing, swimming with dolphins in Mexico is one of them, the thing is how to choose between all the options Delphinus has for you. Today in our blog, we’ll help you to pick the perfect option according to your personality. Not all the interactions are the same, however what they do have in common is how amazing they are, and how through them you will learn how wonderful dolphins are, and why they are the most intelligent and surprising mammals in the ocean. In this interaction, you will swim with dolphins alone, since it is a personalized experience of 45 minutes in the water. Triumphant Personality: the character traits that define this personality include self-confidence, great social skills, knowing how to comunicate with others, competitive spirit and sucess. If you feel identified with this description, The One is definitely the interaction for you. For a whole hour, you and your partner will enjoy a magical experience with dolphins and experiment 8 different activities. Romantic Personality: a romantic personality is defined by the appreciation of beautiful things, creativity and sensitivity, the pleasure of sharing good experiences with people we care about the most. These interactions have the peculiarity of being accessible to larger groups. During your holidays in Cancun, you can share the experience of swimming with dolphins with 5 more persons (Primax 6), 3 more (Primax 4) or 9 more (Interax). Helper Personality: someone with this kind of personality is oriented towards others, generous and willing to collaborate. Do you imagine being able to communicate with dolphins with signs and make them respond with attitudes? Thanks to the Trainer for a Day Interaction, this is possible. During more than an hour and a half you will be in touch with them and it will be an unforgettable experience. Enthusiastic Personality: this personality corresponds to someone who likes to live new experiences, is cheerful, optimistic and trustworthy, doesn’t fear challenges and avoids boredom anyway he can. If you feel identified, are you ready to be a Trainer for a Day? Walk under the water surrounded by dolphins, swim freely with them or learn to take care of the environment through the direct contact with nature thanks to these unique interactions. Challenger Personality: if you like to take control of situations that you’re going through, prove your strength and resist weakness, then you have the challenger personality and any of these interactions is right for you. Do you dare to live it? 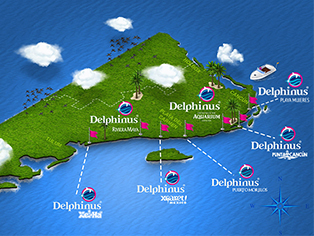 In Delphinus you will live a unique experience that you can adapt to your preferences and personality. Live unforgettable holidays in Cancun and if you’re ready to choose your dolphin interaction, the only thing you have to do is to book right now.